PHILADELPHIA: BOERICKE & TAFEL. 1896. Acid Taste. – Natr. phos. Acrid. – Burning sensation on the tongue, slight, Sang, nitr., Ptelea. Air. – Sensation of cold air passing over tongue. Aeon. Angina. – Tongue distended, giving patient silly expression in angina or diphtheria, Lyco. Camph. – in pregnant and nursing women, Caulo. – dirty looking ulcers and purple blotches in mouth and on tip of tongue, Plb. – which are accompanied with rhagades on the whitish-coated tongue, Cicuta. – acute inflammation and a. ulceration of mouth, tongue and fauces, with burning, stinging pains, Arum tr. – follicular ulceration of mouth and tongue. Kali chl. Ash colored. – Mercurius i. fl. – tongue dry in morning on a., Clem. Back. 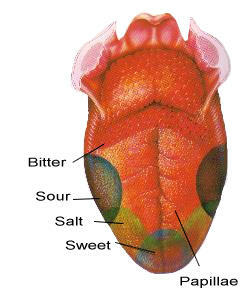 – Taste, sweetish, sour or metallic on b. part of tongue, Bism. – pain in b. part of tongue as if swollen, Spigelia part black, Veratrum alb. – furred thickly, Kali bichromicum, (yellow), Nux vomica, phyto. – yellow bright (tip and edges red), Mercurius i. fl. – of, painful when protruded, Cocc. – of, yellow, thick, Mercurius i. fl. – of tongue covered with a thick, dirty-yellow coating, especially on rising in morning. Mercurius i. fl. Beet. – Tongue red like a b., Nitr. ac. – tongue red like a b., with prominent papillae, Arum tr. – ulcers on tongue, Natr. mur. – sense of. Aeon., Am. Bites tongue in epilepsy, Absinth., Camph. – tongue when chewing, Nitr. ac. – tongue, Absinth., Dioscorea, Ignatia, Phosphorus ac. Thuja. Bitterness on palate with dryness of tongue, Carbo. veg. – posterior part of tongue black, Veratrum alb. – tongue turns black, Carb. veg. – tongue dry, red b., stiff and cracked, Lachesis, rhus tox. – tongue thick, bluish, covered with grayish- white membrane (false membrane), or containing deep ulcers with b. bases; vesicles with burning. Mercurius ac. – tongue purple, b., white, Opi. – tongue coated b., Arsenicum, China, Elaps., Lachesis, Merc, Opi., Phosphorus, Secale, Veratrum alb. – coating on, small. Am. caust. – on the edges, Nux. vom. – on the centre, Lept. – streak down center of, Cblor. hydr. Blackish. – China, Merc, Phosphorus, Sec, Veratrum alb. – tongue cold, dry, b., cracked, red and swollen, veratrum alb. – tongue red with b. coat, Mercurius cor. – cheeks, tongue, lips and palate, they b. from least contact, Magn. carb. Blisters on tip of tongue, Natr. phos., Natr. sulph. – on tip. Am. mur., Natr. Sulph., Nitr. – on tip, burning, Nitr., Am. mur. – on swallowing, red tip, Phyto. – sore burning b. on tongue, Argentum met. – painful red blister on tongue, as if surface were eroded, Borax. – small burning b. on tongue, painful to touch, Caps. – tip of tongue sore, burning (Calcarea carb., Carb. an., Cole, Kali carb. ), little b. on it, Calcarea ph. – mouth slimy, b. on inner surface of cheek and tongue, Calcarea carb. Burning, stinging b. on tongue and buccal cavity, Kali chl. Numerous b. on tongue which have a burning pain, Lyco. – with burning pain on tip of tongue, Natr. sulph. – and ulcers on tongue and on its margin, with burning pain when touched, Nitr. ac. – small b. on tip of tongue, Mercurius bij. Blood. – Tongue covered with a tough yellow coating, taste putrid, taste of b., Asclep. tub. Blotches. – Aphthae, dirty-looking ulcers and purple b. – in mouth and on tip of tongue, Plb. – sticky and moist, Carb. veg. Bluish- Red. – Raph. ; in spots, Argentum nit. – tip, rest white, Sabad. Borders. – Tongue coated white with red tip and b., Sulphur, Rhus tox. Boring on Tongue. – Clem., Conium (at night). – fetid, with white tongue. Kali brom. Bright-Red, with rawness, Magn. phos. Broad, red with indented edges, Kali bichromicum, Merc, viv., Podophyllum, Rhus. – and white, center brown, Viburn. – brownish, Nux vomica, Kali phos., Natr. Sulph. – brownish-yellow, Cina. Ptelea (dry), Rumex. – brownish coating. Belladonna, Cocculus indicus c, Hyoscyamus, Phosphorus, Sabina, Silicea, Sulph, Veratrum alb. – brown streak in center, with thick white coat, Ailanth. – brown streak in center, white edges, lod. – down middle, edges moist. Apis. – yellow along center, first white with reddish papillae, followed by yellow b. coating. – b. down centre, (Plb.). – cracked, sore, ulcerated, Baptisia (Apis, Arsenicum, rhus tox.). – tongue coated with yellow b. mucus, Carb. veg. Tongue coated thick and b., diphtheria. China ars. – dry, b., coated tongue, Cocculus indicus c.
Tongue scarlet-red, b or swollen, Crot. hor. – margin of tongue red, b. fur down center, Plb. (Baptisia, Phosphorus). – tongue b., yellow, dry, Ptelea. – tongue covered with b. mucus, Rhus tox. – tongue coated yellow, yellowish b. or reddish b. Rumex. – Root of tongue b. without bad taste, in morning, Verb. – press of teeth, Vib. op. – vesicles on tongue burn much, Nitr. ac. – mouth and tongue b. as if scalded, Mag. mur. – tongue smarts as if burned. Am. brom. – tongue feels as if burned, Rumex. – burning, tingling and numbness of lips, mouth and tongue. Aeon. – sensation as if tongue is swollen; burning, prickling, tingling, Aeon. – burning vesicles on tongue. Aeon. – burning like pepper on lips and tongue. Aeon. – vesicles on tip of tongue with burning pain. Am.mur. (Arsenicum, Mercurius cor.). – blister on tip of tongue, with burning pain. Am. mur. – rawness, burning and painful stinging blisters along edges of tongue. Apis. – sore, burning blisters on tongue, Argentum met. Burning in mouth, pharynx, and oesophagus, Arsenicum, (Aeon., Cantharis, Caps.). – cracked tongue, painful and burning, Arum tr. – smarting, b. pain in tip of tongue, cracked and sore. Baryta carb. – mouth, tongue and fauces with b., stinging pains. Arum tr. – hardness on middle of tongue, b. when touched. Baryta carb. – burning on tip of tongue, Coloc., Cyclamen, Gum. gut., Hydrastis, Kali carb., Kali jod., Merc, Natr. carb., Natr. mur.. Rat., Sabad. – burning blister, vesicles on lower side of tip of tongue, Graphites, Merc, viv., Nitr. ac. – burning on tongue or tip which feels hard. Gum. gut. – burning pimples on tongue, Kali mur. – burning and soreness on tip of tongue. Kali carb. – blisters stinging, b. on tongue and buccal cavity, Kali chl. – burning vesicles on gums and on inside of cheeks, tongue, lips and palate, they bleed from least contact, Magn. carb. – rhagades in tongue with violent b., Magn. carb. – burning vesicles on left side of tongue, Mang. – red tongue with much b. and great thirst, Mercurius viv. – mouth and tongue b. and parched, Mercurius cor. – blisters with b. pain on tip of tongue, Natr. sulph. – blisters and ulcers on tongue and its margins, with b. pain when touched, Nitr. ac. – violent b. in tongue and mouth extending to stomach, Arsenicum, Mez. – burning on tip of tongue as if full of cracks, Natr. sulph. – vesicles and ulcers in mouth and on tongue, smarting and b. when touched by food, Natr. mur. – burning sensation in tongue and fauces, Tabac. – burning on anterior half of tongue, Gum. gut. – swelling of lower lip and tip of tongue, with violent b. that wakes one at night, Natr. mur. – tongue burns like fire, Magn. mur. – blisters in mouth pain as if burnt, Ambr. – tongue feels as if burnt, coated whitish, Cimex. – tongue rough, dry or feels cold, numb or burnt, Laur. – tongue feels burnt, mouth feels scalded, Magn. mur. – tongue feels burnt. Iris, Acid Sulphuricum, Hamamelis, Rumex., Therid. – sensation on tip of tongue as if burnt, Lactuca., Mercurius sol. – mint, with peculiar onion or garlic taste, Bisulph. of carb. – burning, sensation of, on tongue, Menisp. – burning, prickling sensation of the tongue, Ptelea. – burning on tongue. Aeon., Apis., Arsenicum, Arum. Asarum europaeum, Baryta carb., Belladonna, Bisulph. of carb., Bovista Calcarea carb., Carb. veg., Causticum, Cimex, Cocculus indicus c. Coloc., Colchicum, Daph., Dioscorea, Gum. gut., Hyoscyamus, Hipp, m., Ind., lod., Ignatia, Jac. car.. Kali chl., Kali carb., Lachesis, Magn. mur., Merc, Merc cor., Menisp., Natr. sulph., Ol. an.. Acid oxalicum, PhelL, Phosphorus, Phosphorus ac. Platina, Podophyllum, Plumb., Pulsatilla, Prun. s., Ptelea., Ranunculus sc. Rat., Rhododendron, Sanguinaria, Sabad., Senega., Sepia, Sulphur, Spigelia, Ver alb. – burning sensation across, Asarum. Eup. – burning on tongue, causes irritation to cough, Aconite ferox. – burning on tip, Baryta c., Calcarea carb., Carb. an., Colchicum, Coloc., Cyclamen, Gumm. gut., Hydrastis, Hydroc. ac., Kali carb., Kali hydr., Kali jod., Lact., Mercurius s., Natr. carb., Natr. mur., Rat., sabad. – burning right side, following violent sticking, Kali nit. Cancer of tongue, Aurum, Arsenicum, Hydrastis, Kali cyan., Silicea, Thuja, Tarent. (?) Galium. Cancerous tumor on the tongue, Galium, Semper. Ceases. – Tongue very foul, but becomes clean at each menstrual flow, returning again when flow c. Sepia. – tongue vivid red at tip and edges, coated yellow in – c.; whitish and dry, Fluor, ac. Center. – Margin of tongue red, brown fur down c., Baptisia, Phosphorus, Plb. – tongue yellow with red stripe in c, Verbascum vir. – tongue dry, broad and white; c, brown; leaves impress of teeth, Vib. op. – tongue black down the center, Lept., Chlorum hydr. – tongue fissured in c., Mez. – tongue hard in c., Baryta carb. – tongue whitish coating, thickly covered, brown in c, Ailanth. gl. – tongue yellow along center, with pain in submaxillary gland, Lept. – tongue yellow along center and base, Ptelea. – tongue yellowish along the center. Pulsatilla Nut. – tongue white, c. and base, sides very red, Rhus ven. – tongue yellow along c, with flat, bitter taste in the morning; Verbascum vir.